Caregiving is a complex health care activity. From an informal family level activity, it is becoming a major part of health care. There is a growing awareness of the mental health aspects of caregiving both in the economically rich and low- and middle-income countries. It is this aspect of addressing the emotional dimensions of caregiving, in addition to importance to care receivers and to utilize the caregiving situations to address the prevention of mental disorders, promotion of mental health, and fight stigma of mental disorders that I will address in this article. In India, caregiving is largely by the family members as there are extremely limited alternative institutional facilities and welfare supports for those with long-standing illnesses such as mental disorders, chronic illnesses such as diabetes and cancer. In addition, in India, most families prefer to care for the ill person at all stages of illness. However, the larger societal changes in the country are placing significant demands on the caregivers. Two of the changes making caregiving difficult are living in urban areas and living in nuclear families. The lack of a supportive community in urban areas and the limited resources in a nuclear family make caring a demand on the caregivers and places their mental health at risk. This article will address: (1) The changing care situation for mental disorders and chronic illnesses; (2) the impact of caregiving on caregivers; (3) interventions to address mental health needs of caregivers; (4) an agenda for India to address this issue. However, de-institutionalization has not been an unqualified success, and community care still faces some operational problems. Among the reasons for the lack of better results are that governments have not allocated resources saved by closing hospitals to community care; professionals have not been adequately prepared to accept their changing roles; and the stigma attached to mental disorders remains strong, resulting in negative public attitudes toward people with mental disorders. In India, for want of public health services, both for mental disorders and chronic illnesses, the caregiving by family members is the norm. There is a growing awareness of noncommunicable diseases (NCD) in India:  "India's epidemic of chronic diseases and injuries has already passed its early stages; the demographic and epidemiological transitions that are in progress have important implications for individuals, families, communities, and the nation as a whole. The time to act is now. For universal health care to be achieved, the emerging agenda of chronic diseases and injuries should be a political priority and central to the national consciousness of India." Self-care and caregiving will be a vital part of care of this group of health conditions. As most of the care of this group of disorders is "chronic" and will occur at homes rather than hospitals, caregiving will be an important aspect of care. It is these developments that call for examination of caregiving as an essential part of health care. There is a need to understand its potential and the required measures to meet the needs of the caregivers. There is a large body of research pointing to the emotional impact of caregiving in mental disorders and other "chronic" illnesses. In India, almost all the persons suffering from schizophrenia illness are living with the families. Thus, the understanding of the burden of care and developing interventions to ameliorate the burden of care is important in the Indian context and has been studied by a number of investigators. One of the earliest studies was in Chandigarh with families of persons diagnosed with schizophrenic illness. The impact and the caregivers and the need for support were the chief observations of this community study. Sandhu  provides the first novel describing the "live-in" experiences of a son and father struggling to cope with the ill family member suffering from paranoid schizophrenia. This descriptive account is an important contribution to understand the real life of the ill persons and their families. The vital role of professionals comes through vividly in the following statement, "I understand that psychiatrists are not God, but for the helpless caregivers they are nearly like God." He makes the point "as doctors, we must realize that we are only one vertex of the pyramid, the patient being the other. The third vertex, the caregiver, is important, very important if the pyramid of health care has to stand tall" (p. 69). Addlakha  describes a case study of a female with chronic mental illness from a lower middle class urban family in New Delhi. Rammohan et al. studied 24 parents and 24 spouses of persons suffering from schizophrenia. Spouses reported greater emotional burden. Parents used more of denial as a coping strategy, whereas spouses used more of negative distraction strategies. Patients' age, educational level, level of functioning, and caregiver's use of denial as coping strategy emerged as significant predictors of caregiver burden. Trivedi et al. and Kalra et al. report on the family burden of key caregivers of schizophrenia from Lucknow. Kalra et al. studied 30 persons suffering from schizophrenia and 50 persons suffering from obsessive compulsive disorder. There was a direct correlation between burden and severity of disability and degree of psychopathology. Suresh Kumar  studied 140 patients of schizophrenia from rural Karnataka and reported a significant direct correlation between disability and psychopathology on the one hand and level of burden on the other hand. Duration of treatment had inverse correlation with burden. Disability in patients was the most significant factor contributing to burden. NIMHANS, Bengaluru, carried out qualitative studies of caregivers. Thirty caregivers of inpatients with schizophrenia participated in 5 focus group discussions (FGD), where the needs of the caregivers were discussed. The FGDs were recorded, transcribed, and similar needs were grouped and ranked according to their order of importance. The main needs that emerged were needs regarding managing behavior of patients (29%), managing social-vocational problems of patients (21%), health issues of caregivers (18%), education about schizophrenia (15%), rehabilitation (13%), and managing sexual and marital problems of patients (5%). Authors describe this as the pyramid of needs of caregivers. All family caregivers who attended the FGD emphatically stated that they required help in managing all their needs and expressed their willingness to participate in any training that addressed their needs. The complex role played by the family in the care is reported by Srinivasan and Thara  with regard to noncompliance for medication in acutely ill patients of schizophrenia. The experience is based on 254 outpatients, of which 58% were noncompliant for medication. In this group, families administered medicines without patients' knowledge, under the supervision of the psychiatrist. In a great majority of patients who were given involuntary medication, the family observed a reduction in the severity of symptoms and further able to convince the patient to take oral medication subsequently. In 26% on such medication, patients came to know and of these two-thirds expressed anger and resentment whereas the others accepted without any reaction. Of the caregivers, there were three types of reactions. More than half (55%) of them felt it was the right action under the circumstances. Another 41% recognized it as a practical one in the absence of any alternatives whereas 4% reported that the method was not appropriate. Authors discuss the issues of risks and benefits, patients', family, professional, and ethical perspectives. Nehra et al. compared caregiver-coping in bipolar disorder (bipolar affective disorder [BPAD]) and schizophrenia and explore the determinants of such coping in fifty patients each of BPAD and schizophrenia and their caregivers. High levels of patient dysfunction and caregiver burden, low awareness of illness, and low perceived control over patient's behavior were characteristics of both BPAD and schizophrenia, with no significant differences between the two groups on these parameters. Coping patterns were also quite alike, though caregivers of patients with schizophrenia were using some emotion-focused strategies significantly more often. Among the NCDs, the vital role of caregivers in the Indian context comes from the large literature on cancer care. The Indian Cancer Society publication, "there is life after cancer"  presents the experiences of 34 persons/families diagnosed with cancer. Here are some excerpts relating to caregiving from these narratives. Ms. Shikha Shaukeen and Ms. Raj Rani place the complimentary roles of the patients and caregivers beautifully as follows:  "It is the survivor and the caregiver who together fight the battle, each offering love, support, and encouragement to the other. There is suffering and pain, some shared and a lot kept from the other. No one but the survivor undergoes the physical pain, fear, and trauma that the cancer patient is faced with; the caregiver's pain is mental and emotional. Not only does the caregiver help with the loved one's needs and treatment, often taking critical decisions, she/he has to be strong one offering emotional support at a time when she/he is hurting too. It is not easy to evaluate the contribution made by a caregiver in contributing to the well-being of the patient and restoring his/her confidence and faith. The caregiver applies a soothing balm to the lacerated psyche of the patient by giving loving care. In fact, the doctor and the caregiver make an excellent team; the former treating the patient's physical sickness and the latter by restoring the patient's shattered self-confidence and morale" (p. 181). Few of the other narratives of caregiving from India, are Ms. Anuradha Mittal  shares the following feelings: as caregivers, we also went through all the stages of shock, denial, anger, helplessness, and finally acceptance. The moment the word "cancer" is announced, your peaceful world is suddenly shattered. Everything seems to fall apart and the first reaction is "it means the end of the road" (p. 13). In another narrative, Ms. Gurpreet Khaira  shares, "the most important thing was that I was getting the full support from my husband and both of my daughters" (p. 36). Ms. Karuna Puri  writes, "it was my husband's will power that helped me in my battle against cancer.… He slept in my room throughout my sickness. He was there for me whenever I needed him" (p. 91). Three recent Indian memoirs of caring for a family member with dementia and bipolar disorder describe the challenges of caregiving in the Indian situation, as follows. Pinto describes his mother's illness in The Hindu Literacy Award book, "Em and the Hoom"  and what it meant to the family: "It was the worst possible nightmare we could conceive because we had no idea what we would do if we had to do it all over on our own; monitor her pills, decide when she went to hospital, hold on to her life with a daily promise, pay her bills, take her raging or desperate calls earn a living" (p. 171). "The current state of the care and education workforce for these children is one of the most telling indicators of this fragmentation. Despite their shared objective of nurturing and securing the future success of young children, these professionals are not acknowledged as a cohesive workforce, unified by their shared contributions, and the common knowledge base and competencies needed to do their jobs well. They work in disparate systems, and the expectations and requirements for their preparation and credentials have not kept pace with what the science of child development and early learning indicates children need. Care and education for young children take place in many different programs and settings, with different practitioner traditions and cultures; funded through multiple governmental and nongovernmental sources and operating under the management or regulatory oversight of diverse agencies with varying policies, incentives, and constraints. Strengthening the workforce to better reflect the science is challenging given this complex, and often decentralized, oversight, and influence." Majority of the persons suffering from schizophrenia are living in the community and mostly with their families in India  and other developing countries. It is for this reason, as noted in the earlier section, families have been an important part of the care of the ill persons. During the last two decades, the movement of empowerment of the families has taken a number of directions. There have been two national level carer workshops at Chennai in 2001 and 2005 to understand the needs and experiences of carer groups. A National Alliance has been formed of these voluntary groups. At a number of centers, there have been efforts to develop educational materials (e.g., we are not alone from Amend from Bengaluru), to form self-help groups (Bengaluru, Chennai, New Delhi, Gauhati, Pune, Kolkata, Mumbai etc. ),  and to take up advocacy activities. Interventions to address the emotional needs of caregivers have been undertaken by a number of investigators. Most of the efforts have been in the areas of dementia and cancer. Two recent reports are significant. Livingston et al. recognizing two-thirds of people with dementia live at home supported mainly by family carers and these carers frequently develop clinical depression or anxiety, which predicts care breakdown, the intervention was planned to assess the clinical effectiveness (long-term reduction of depression and anxiety symptoms in family carers) and cost-effectiveness of a psychological intervention called STrAtegies for RelaTives (START). It is a randomized, parallel-group trial with masked outcome assessments in three UK mental health services and one neurological outpatient dementia service. Carers were randomly assigned to either START, an 8-session, manual-based coping intervention delivered by supervised psychology graduates or treatment as usual (TAU). The primary long-term outcomes were affective symptoms, 2 years after randomization, and cost-effectiveness (health and social care perspectives) over 24 months. Two hundred and sixty carers were recruited. One hundred and seventy-three carers were randomly assigned to START and 87 to TAU. Of these 260 participants, 209 (80%) were included in the clinical efficacy analysis (140 START, 69 TAU). At 24 months, compared with TAU, the START group was significantly better for depression and anxiety scores. Carers in the control TAU group were 7 times more likely to have clinically significant depression than those receiving START. The intervention was cost-effective for both carers and patients. Authors conclude that START is clinically effective, improving carer mood and anxiety levels for 2 years. This cost-neutral intervention, which substantially improves family carers' mental health and quality of life (QOL), should therefore be widely available. Leow et al. evaluated the effectiveness of a psychoeducational intervention, the Caring for the Caregiver Program (CCP) in cancer care in a randomized, controlled trial, two-group pretest and repeated posttests. Four home hospice organizations and an outpatient clinic in Singapore were the setting for the study. Eighty caregivers were randomized into experimental and standard care groups. Outcomes were measured at baseline, week 4, and week 8 after the intervention. The standard care group received routine home hospice care and the intervention group received the CCP in addition to routine care. QOL, social support, stress and depression, self-efficacy in self-care, closeness with the patient, rewards, and knowledge were studied. Compared to the standard care group, the intervention group reported significantly higher QOL, social support satisfaction and number of supported people, closeness with the patient, self-efficacy in self-care, rewards of caregiving and knowledge, and lower stress and depression. Authors conclude that the CCP had positive effects on family caregivers of patients with advanced cancer. As reviewed in the earlier section, there are a large number of aspects of caregiving. ,, Caregiving and caregivers will be a growing part of health care all over the world and in India. However, in the last seven decades, we have not really looked at what caregiving means to the caregivers. It was two decades back, Prabhu  had this to say about this issue: "It is high time that one evaluates the strengths and weaknesses of the oriental family and its ability to care for the mentally disabled persons" and similar was the observation of Radha Shankar. "There is limited holistic understanding of both the difficult circumstances under which relatives look after persons with serious mental illness, as also the emotional and practical challenges they face through the different phases of the illness. Consequently, families receive limited support and guidance from professionals, suggesting that mental health establishment often regards family members as low cost, plentiful resource in the community, who are required to offset the limitations of a poorly funded mental health system. However, if these primary care providers have to offer long-term sustainable care, it is both ethical and imperative that their needs have to be understood and addressed in a systematic manner.… Family caregivers need to be supported and nurtured through programs of information and guidance and practical assistance (emphasis added)." There are five issues that need urgent attention in India. Second, caregiving in India occurs with no specific "sharing of skills" with caregivers' family members. Most of the past efforts have been on information sharing. There is a need to move the agenda of this area to develop and share specific skills of care as essential care programs of mental health care. There is some initial success in this area in the area of substance abuse, especially by TTR foundation ,,, and for alcohol abuse and parenting by NIMHANS, Bengaluru. ,,, There is a need to develop similar educational materials for each of the mental disorders in all of the states and union territories in a culturally and linguistically suitable manner. A successful addressing of these caregiving resources would address a large "unmet need" of mental health care in India. Stigma experiences of caregivers, especially in dementia, cancer, alcoholism, schizophrenia, intellectual disability, and measures to fight the stigma. Health care in India is in a flux, with a desire for universal health coverage for all health conditions  and for mental and neurological disorders. In the current context of limited health care coverage, caregiving by family and nonprofessionals will be an important part of health care in India. This necessitates attention being paid to caregiving and caregivers. Caregiving can be demanding on the caregiver. Caregiving can also be fulfilling for the caregiver. Caregivers' emotional health is important not only for the caregiver, but also for the care receiver. The goal should be to minimize the stress of caregiving and maximize the positive feelings of caregiving. For health care in general and mental health and "chronic illness" care, in particular, there is an urgent need to fully understand the caregiving in different communities, population groups, and develop programs to make caregiving a positive experience. In a recent reference to emerging India, Forbes India (January 09, 2010) observed "first world India is an increasingly popular concept. Much has been made of how our time as a country has arrived; of how we are at an inflection point in our history. But how are we going to translate this potential into performance?" As in other areas, India has the opportunity to build upon the strength of the caregiving commitment of Indian families and the experiences of the West to make caregiving an important component of health care in the country. By developing systems of sharing of skills, support, and supervision to caregivers, in providing care to the individuals with chronic illnesses, India could contribute to health care in the world. This could be India's important mental health contribution to the rest of the world. My sincere thanks to Prof. N. N. Wig, Emeritus Professor of Psychiatry, PGIMER, Chandigarh, for his support and suggestions about the earlier thoughts in this area. Dr. K. S. Raghavan, Hyderabad, enriched my thoughts on this topic by his insights as a professional and caregiver. Finally, to all the families I have had the opportunity to work with in the last four decades for sharing their personal journeys of caregiving. World Federation of Mental Health (WFMH). Caring for the Caregiver. Woodbridge, USA: World Federation of Mental Health; 2013. World Health Organisation (WHO). World Health Report-2001: Mental Health-New Understanding, New Hope. Geneva, Switzerland: World Health Organisation; 2001. Poo A. The Age of Dignity - Preparing for the Elderly Boom in a Changing USA. New York: The New Press; 2015. World Health Organisation. Mental Health Action Plan (2013-2020). Geneva, Switzerland: World Health Organisation; 2013. Patel V, Chatterji S, Chisholm D, Ebrahim S, Gopalakrishna G, Mathers C, et al. India: Towards universal health coverage 3-chronic diseases and injuries in India. Lancet 2011;377:413-28. Srinivasa Murthy R. Schizophrenia: Epidemiology and community aspects (1996-2010). In: Kulhara P, Avasathi A, Grover S, editors. Schizophrenia - The Indian Scene. Ch. 4. Chandigarh: PGIMER; 2010. p. 57-112. Suman C, Baldev S, Murthy RS, Wig NN. Helping the chronic schizophrenic and their families in the community-initial observations. Indian J Psychiatry 1980;22:97-102. Sandhu A. Sepia Leaves. New Delhi: Rupa Publications; 2008. Addlakha R. An ethcography of family burden and coping strategies in chronic schizophrenia. Indian J Psychiatry 1999;41:91-5. Rammohan A, Rao K, Subbakrishna DK. Burden and coping in caregivers of persons with schizophrenia. Indian J Psychiatry 2002;44:220-7. Trivedi JK, Nischal A, Sinha PK, Dhyani M. Burden of care caregivers of schizophrenia: A study from Northern India. Aust N Z J Psychiatry 2006;40:A134. Kalra H, Nischal A, Trivedi JK, Dalal PK, Sinha PK. Extent and determinants of burden of care in Indian families: A comparison between obsessive-compulsive disorder and schizophrenia. Int J Soc Psychiatry 2009;55:28-38. Suresh Kumar PN. Impact of vocational rehabilitation on social functioning, cognitive functioning, and psychopathology in patients with chronic schizophrenia. Indian J Psychiatry 2008;50:257-61. Jagannathan A, Hamza A, Thirthahalli J, Nagendra HR, Hapipraqsad VR, Gangadhar BN. 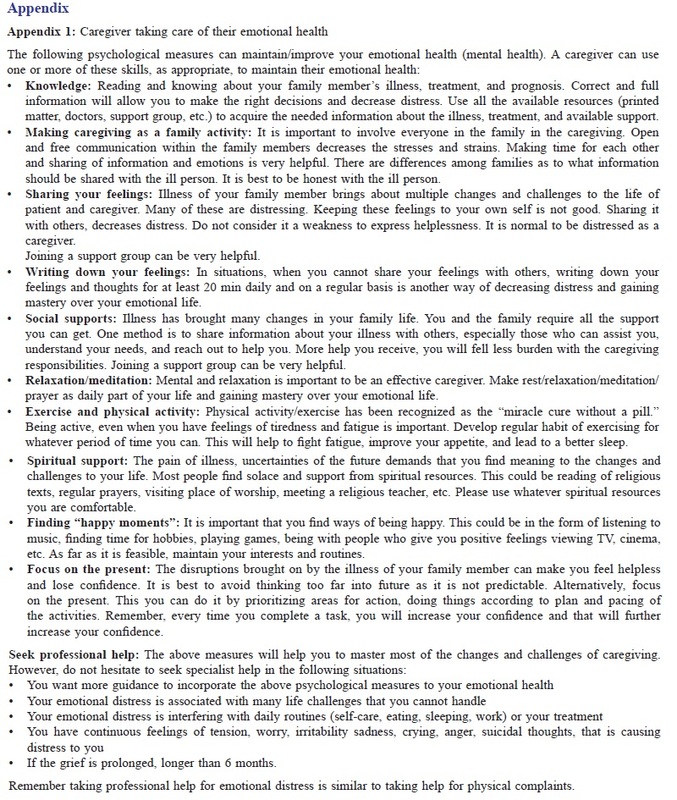 Need of Family Caregivers of Inpatients with Schizophrenia in India, Poster Presentation at the Third International Conference on Schizophrenia, Chennai; 17-19 October, 2008. p. 48. Srinivasan TN, Thara R. At issue: Management of medication noncompliance in schizophrenia by families in India. Schizophr Bull 2002;28:531-5. Govil J, editor. Indian Cancer Society (ICS) There is hope after cancer. New Delhi: Vitasta; 2013. Chaudhury M. World Within. Kindle Edition. Hay House, New Delhi: Amazon Books; 2015. Pinto J. Em and the Big Hoom. New Delhi: Aleph; 2012. Samaddar R. Krishna, Living with Alzheimers. New Delhi: Women Unlimited; 2015. National Cancer Institute (NCI). Support for Caregivers: When Someone You Love Has Advanced Cancer. Bethesda, USA: US Department of Health and Human Services; 2014. Srinivasan N. We are not alone-family care for persons with mental illness. Bangalore: Action for Mental Illness (ACMI); 2008. Livingston G, Barber J, Rapaport P, Knapp M, Griffin M, King D, et al. Long-term clinical and cost-effectiveness of psychological intervention for family carers of people with dementia: A single-blind, randomised, controlled trial. Lancet Psychiatry 2014;1:539-48. Leow M, Chan S, Chan M. A pilot randomized, controlled trial of the effectiveness of a psychoeducational intervention on family caregivers of patients with advanced cancer. Oncol Nurs Forum 2015;42:E63-72. Institute of Medicine (IOM). Transforming the Workforce for Children Birth through Age 8: A Unifying Foundation. Washington: National Academy Press; 2015. Carstairs GM. In community action for mental health care. WHO/SEARO/MENT/22. New Delhi: Who-Searo; 1974. Kohlmeyer WA, Fernandes X. Psychiatry in India: Family approach in the treatment of mental disorders. Am J Psychiatry 1963;119:1033-7. Narayanan HS, Reddy GN. Review of treatment in family ward. Indian J Psychiatry 1968;14:123. Prabhu GG. Foreword - Innovations in Psychiatric Rehabilitation. Bangalore: Richmond Fellowship of India; 1995. p. 5-8. Shankar R. Interventions with families of people with schizophrenia in India. New Dir Ment Health Serv 1994;62:79-88. Thara R, Patel V, editors. NGOs in mental health: Meeting the need? In: Meeting Mental Health Needs of Developing Countries: NGO Innovations in India. New Delhi: Sage (India); 2003. Srinivasa Murthy R, editor. Mental health by the people. Bangalore: Published by Peoples Action for Mental Health; 2006. Murthy SR. Human resources for mental health care in India - Challenges and opportunities. Indian J Psychiatry 2004;46:361-6. Layard R, Clark DM. Thrive - The Power of Psychological Therapy. U.K: Penguin; 2014. Ranganathan S. The empowered community: A paradigm shift in the treatment of alcoholism. Madras: TTR Clinical Research Foundation; 1996. Ranganathan S. Treatment for alcoholism - The community approach. Chennai: TT Ranganathan Clinical Research Foundation; 2011. Jayaraman R, Ranganatha S. I plan and I can - Tips and tools for personal recovery. Chennai: TT Ranganathan Clinical Research Foundation; 2011. Jayaraman R, Kanakam U. Getting out of alcoholism-my personal recovery tools. Chennai: TT Ranganathan Clinical Research Foundation; 2010. Nattala P, Murthy P, Nagarajaiah. Relapse prevention in alcohol dependence: A family based approach - Treatment provider′s manual. Bangalore: National Institute of Mental Health and Neurosciences; 2013. NIMHANS. H2H (Help to Help) women partners of men with alcohol dependence: A counselling manual. Bangalore: National Institute of Mental Health and Neurosciences; 2014. NIMHANS. Relapse Prevention in Alcohol Dependence-My Workbook. Bangalore: National Institute of Mental Health and Neurosciences; 2014. Seshadri S, Rao N. Parenting: The Art and Science of Nurturing. Delhi: Byword Books; 2012. Srinivasa Murthy R. Lessons of being a patient - Psycho-oncology in India. Mens Sana Monogr; 2016. [In Press]. Srinivasa Murthy R. Self-care for mental health - The new frontier. In: Saha G, editor. Different Strokes. 2 nd ed. Kolkata: Indian Psychiatric Society; 2016. Srinivasa Murthy R. The stigma of mental illnesses-present situation and future perspectives. In: Psychiatry: Present Situation and Future Perspectives: Book in honour of Prof. Lopez Ibor; 2016. [In Press]. Patel V, Chisholm D, Parikh R, Charlson FJ, Degenhardt L, Dua T, et al. Addressing the burden of mental, neurological, and substance use disorders: Key messages from Disease Control Priorities, 3 rd edition. Lancet 2015. pii: S0140-673600390-6.